Legislator Sarah Anker and presiding Officer DuWayne Gregory were joined by their colleagues and drug awareness and substance abuse professionals to announce an initiative to address the opiate epidemic in Suffolk County. Legislator Sarah Anker and presiding Officer DuWayne Gregory joined by colleagues and drug awareness and substance abuse professionals. 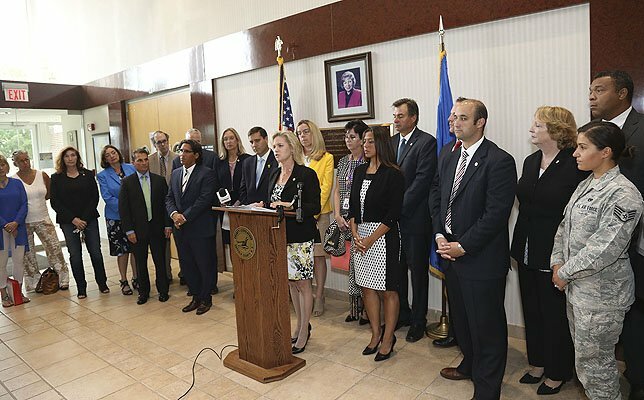 Hauppauge, NY -July 26, 2017 - On Tuesday, July 25th, 2017, Legislator Sarah Anker and presiding Officer DuWayne Gregory were joined by their colleagues and drug awareness and substance abuse professionals to announce an initiative to address the opiate epidemic in Suffolk County. Legislator Anker has put forth legislation to form a permanent Heroin and Opiate Advisory Panel which will address the staggering number of opiate overdoses in Suffolk County. The newly-formed panel, which will be established by Introductory Resolution 1664-2017, will include representatives from the Legislature, including Legislator Sarah Anker representing Presiding Officer DuWayne Gregory, Chair of the Public Safety Committee Legislator Kate Browning, Chair of the Education and Human Services Committee Legislator Monica Martinez, and Chair of the Health Committee Legislator William Spencer. The panel will also include representatives from the Suffolk County Police Department, the Suffolk County Sheriff’s Department, and the Suffolk County Department of Health, as well as local rehabilitation providers, advocacy groups, hospitals, and the Suffolk County Superintendents’ Association. The panel is being established with the goal of providing ongoing guidance and input to the county in combating the opiate epidemic through preventative education, enhancement of enforcement efforts, and aiding in the treatment and rehabilitation of those addicted to opiates and heroin. The ever-evolving nature of the opiate epidemic requires continuous commitment to identify new resources and additional funding sources, and provide for greater focus on educating the public about addiction. "Across Suffolk County, families and communities have suffered from the battle against the opiate epidemic that we are in the midst of. It is incumbent upon us to work on multiple levels to educate, prevent, enforce and treat. I commend Legislator Anker for taking a multidisciplinary approach on this issue to strengthen our ongoing efforts to combat this scourge. I look forward to participating in the working group with other professionals to find and act on real solutions," stated Legislator William R. Spencer, M.D. “It is imperative we address the rising opioid epidemic in Suffolk County and evaluate the actions we may take to bring an end to this tragic affliction affecting our friends and family. This new advisory panel has the ability to answer difficult questions so we may discover the most effective way to combat all matters relating to opioid addiction. I am confident my colleagues and I will effectively use the resources provided through the advisory panel to determine a progressive and successful solution,” said Legislator Monica Martinez. “It is important for law enforcement, health officials and community partners to collaborate in order to determine best practices for dealing with this nationwide epidemic at the local level,” said Dr. James Tomarken, MD, Suffolk County Department of Health Services Commissioner. The advisory panel will meet quarterly and will provide regular reports to the appropriate Suffolk County committees. To aid in their efforts, the panel will conduct a minimum of two formal public hearings annually to acquire necessary information and data to assist them in developing further recommendations. Legislator Anker introduced IR 1664-2017 to establish the panel at the July 25th General Meeting and the Legislature will vote to approve the panel as early as September 6, 2017. For more information, please call Legislator Anker’s office at 631-854-1600. Subject: LongIsland.com - Your Name sent you Article details of "Legislator Anker Announces Permanent Advisory Panel to Address the Opiate Epidemic in Suffolk County"